There's nothing quite as good as the RP150 for the price. But the built-in expression pedal on the RP250 is really indispensable if you want to get the best out of the unit. Excellent features. Sound quality. The price. Inevitable navigation restrictions with only two switches. Over the past couple of years, DigiTech have updated the flagship GNX range, along with some of its more specialised modelling stompboxes. 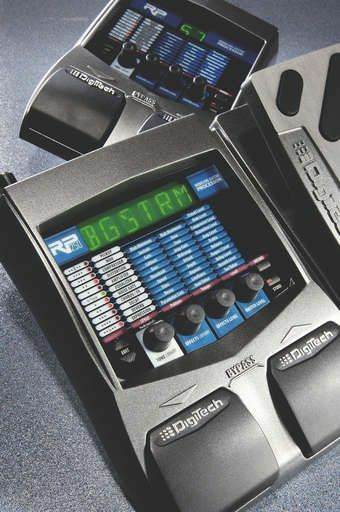 However, don't forget the RP range, which has been a mainstay of the DigiTech product catalogue since the mid-1900s. The layout of this RP150 unit should be immediately familiar if you've used a DigiTech product in the past decade. The main control panel is dominated by the 'matrix' style display, which can also be found on plenty of non-DigiTech products and has thankfully all but completely replaced the older menu/sub-menu based approach to patch editing. Although larger than the older RP100, the concept is the same: a compact pedal with just two footswitches and a few controls for on-the-fly adjustments. For such a small and low-priced FX unit, there's a generous range of connections round the back. Dual left/ right outputs allow you to choose either mono or stereo operation, and a small push-button defeats the cabinet modelling so you can plug into a standard guitar amp rather than going direct into a mixer or soundcard. Then there's a headphone output for late-night practising and an input for an external expression pedal. Finally, here's a sign of how technology has progressed since the last batch of RP units appeared. The USB socket means you can edit patches on a PC with the downloadable X-Edit software, download new patches from the internet or simply record a direct digital signal into your PC recording software. Basic operation is very simple. There are 50 preset patches and 50 user patches, and the two footswitches are used to navigate through them. There's a huge range of effects available, divided into 13 modules (including pickup, amp and cabinet modelling). A number of DigiTech's popular Whammy effects are here, along with some high quality Lexicon reverbs. Then there are nine types of distortion/overdrive, 17 amp models (including acoustic modelling), the usual range of modulation effects and even an intelligent pitch shifter. That's great value for money. That's all very well, but plenty of people are unsure of what to do once they've explored the presets. Editing the presets is fine in theory, but what are all those parameters for? If you're in that category, the 150 has a couple of new features just for you. Of the four large knobs on the main panel, tone library and effects library give you a pain-free way of adjusting the presets. The tone library is a set of 30 guitar amp settings designed for specific musical styles, while the effects library has 30 effects signal chain for various applications. The two remaining knobs on the front panel cover the master output level and the relative level of the post-amp effects (modulation, reverb, delay). The final detail is a drum machine with 65 built-in patterns. It's not flexible enough for songwriting, but an excellent practice and demo tool. We've often remarked on the gradual improvement of DigiTech multi-FX sounds over years, especially once it embraced digital modelling. The later GNX units represent the current peak of its skills, but the quality of the sounds on the RP150 isn't far behind. It works well as a standard stompbox plugged into an amp, but you really need to use the direct stereo output to hear the full range of sounds properly. The amp models can all be found on the GNX3000 and while you lose a lot of the flexibility here, the sound quality seems every bit as good. As you'd expect with the Lexicon badge proudly displayed on the back of the RP150, the reverbs are particularly nice - quite subtle and smooth. The two library options are a great idea, and not just for the technically nervous. We've all been in the situation of trying to find a particular tone (when it's on the 'tip of your tongue' in sonic terms) and the tone and effect libraries really are perfect for inspiration.